Firstly, Claire and Victoria at Howletch Lane Primary have been doing terrific things - particularly using the video and embedding capabilities from ipads to showcase some superb Literacy. Meanwhile, Andrew and William have established Lumley Juniors blogs - I particularly liked the Christmas jokes by the children! I've also added their blogs to the Sidebar with lots of other creative teachers in County Durham showing off the potential of their classes! In other news, our school is embarking on a new blogging project with David Mitchell, so my current class blog can be found at mrtemple201415.tanfieldleaprimary.net. Following interest from more schools, we are holding another one day hands-on Blogging course on 23rd October for forward thinking schools in the North East! As with the previous course, I am proud to say that the 'Creating a Blogging Class' course on 23rd May has been rated as 5/5 by all participants for 'Course Delivery' and 'Course Content'! Wow! 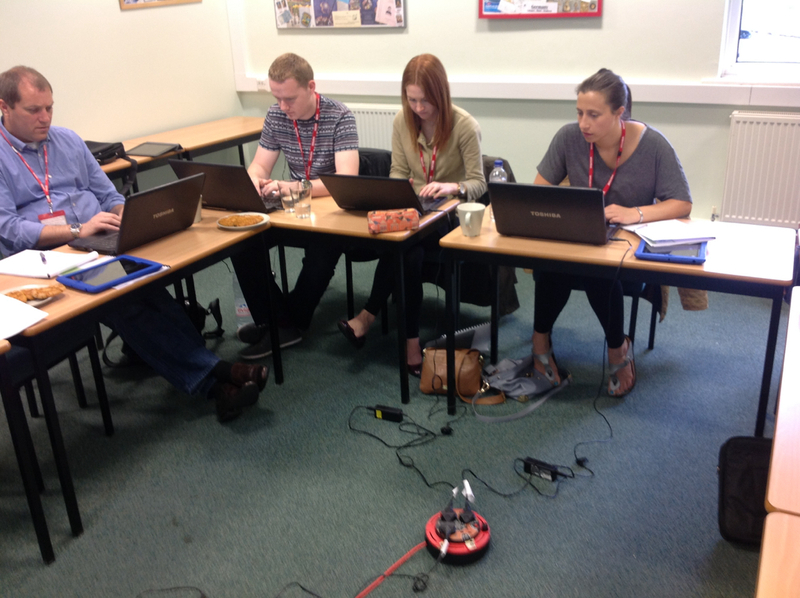 A month has passed since 8 teachers came to Tanfield Lea Primary School for a course to set up new class blogs. I must admit I've been particularly busy and not managed to blog as much (either with the class or personally) as I would like. What a pleasure, then, when I looked at what the participants had got up to with their blogs over the period! Most of the participants have established blogs, with some rolling out other class blogs. As one head said to me, all the other teachers had asked when they could get one, so the whole school was up and running within days! Sunnybrow Primary have set up class blogs for the whole school and even the Head has got involved! 2 participants from Burnside Primary have set up 2 class blogs - I've already asked if I can steal this idea! South Stanley Juniors and Year 5 at St Patricks (Consett) have begun their blogging journey too! 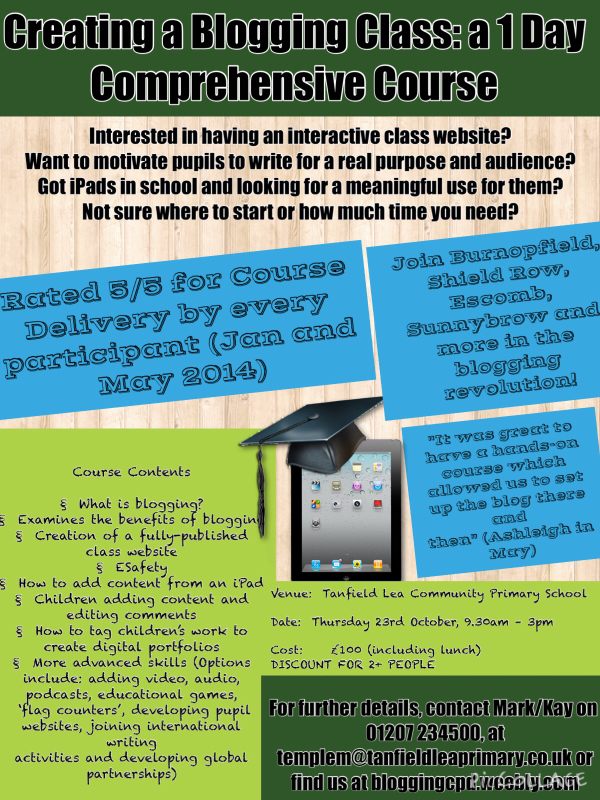 Spaces are starting to fill for the Blogging Course on May 23rd! We hope you can make it; it will change your pupils' attitude to writing and audience! Exciting news! 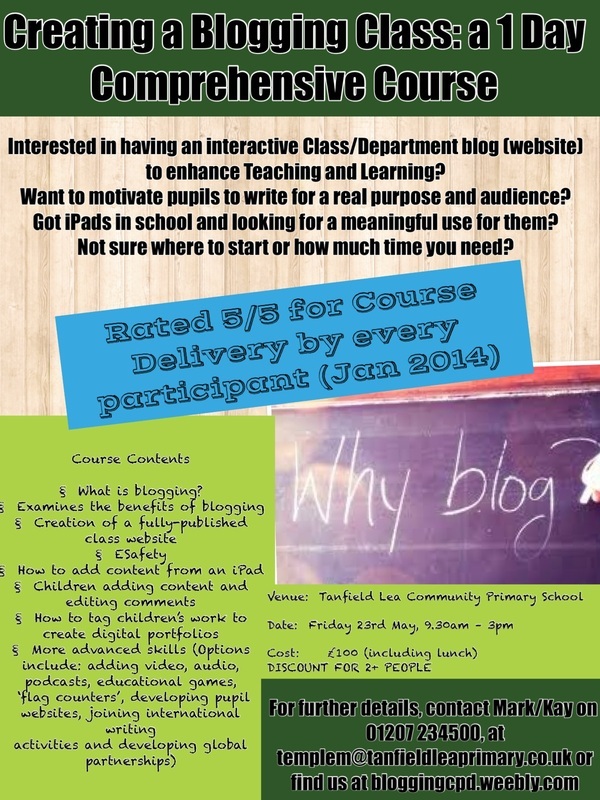 We have a date for a new blogging course: May 23rd at Tanfield Lea Primary. It's the last working day of the half-term for most; why not spend the day creating a working class blog, which can transform the standard of pupils' work by providing them with an international audience for their efforts? No technical expertise required; just some imagination from committed teachers about how to inspire your pupils! For more on the benefits of blogging, click here. For testimonials from the previous course click here, or browse some of the blogs created on our workshops. As a result, this led us to explore giving the children their own logins to add content. We did this by using email accounts linked to each ipad rather than individual children (this saved me lots of work!). It also meant each child can create blog posts on the class blog without the need for logging in and out with long emails. This allows lots of digital content (including posters made on Pic Collage etc.) to be shared without the teacher having the time consuming job of posting work. It also can be used to teach children skills like tagging their work, to create a digital portfolio. As older children are more likely to create content with less teacher support using apps such as iMovie, Show Me, Audioboo etc. (and will want to share it), childrens' logins can free up the valuable time of the teacher. As well as using the blog to share games with children, blogging activities such as 100wc.net are accessible to Year 3 and 4 pupils. This allows children to develop their writing skills, and where combined with children creating blog posts, encourages comments from children and adults around the world, generating a ready-made global audience. I'm sure there are lots more uses for lower KS2 children; as always it's the Year 3 / 4 teachers who come up with age-appropriate innovative ideas! I previously wrote about Blogging in the Foundation Stage. In addition to those ideas, Key Stage 1 children are increasingly able to produce content on iPads, often using an iPad set up by the teacher. Thus, the child creates the content, which is then uploaded by the teacher. This fantastic iPad app allows children to create short podcasts about a subject. Here is a Year 1 who did a recording of something she had learnt in class. Note, also the parental comments, which I have mentioned previously. Audioboo can be used in a similar way, requiring a teacher controlled login. This app allows children to make cartoons. It involves scripting, practising and performing. Here is a snippet of a Year 1 puppet pal! Another way of getting children to contribute to the blog is by giving them an iPad with the Weebly app loaded and getting them to type about what they have been learning. Here a Year 2 child leaves a simple comment about what he has been learning. 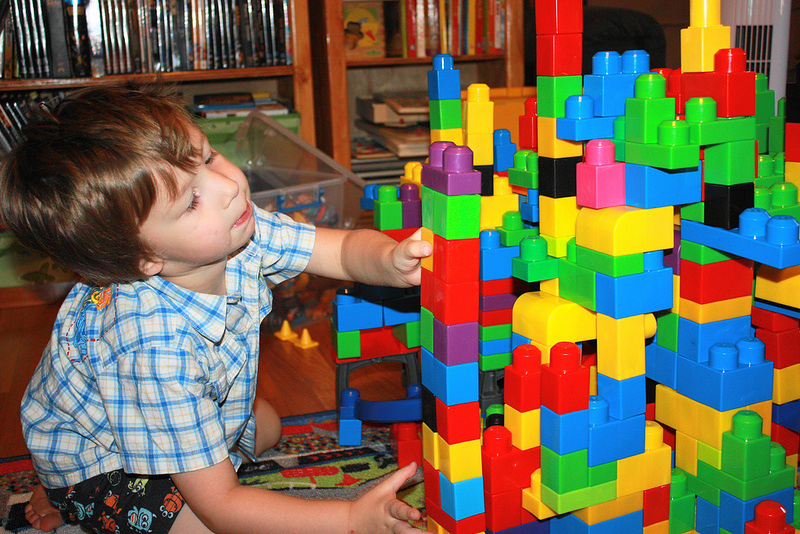 All of the ideas above develop the idea of children creating blog content, without children needing cumbersome logins. Ultimately, the children get the thrill of an audience seeing and commenting their digital work, which is one of the key benefits of class blogs! Following our staff meeting tonight, where the staff discussed different apps which could be used from Early Years to Year 6, I think this is a good opportunity to promote a fantastic resource made by a colleague, @MattPEducation. Recognising the mutually beneficial relationship between blogging and iPads, within his Year 5 blog he has been cataloguing his use of iPads in the classroom. Another great iPad resource which Matt references is (another) Mr P's ICT site! Blogs in our school began in upper KS2 and many class blogs thrive with this age group. The children are digital natives, have regular ICT sessions and enjoy the buzz that a global audience brings. Nevertheless, since our school rolled out blogs to the whole school, the Foundation Stage blog has been the one to watch to judge how 'low you can go' with blogs. In fact, in our school, the Foundation Stage have led the way in developing parental involvement, which I wrote about in my last post. From looking at our FS blog, here are some of the great uses of a Foundation Stage blog! Foundation Stage are brilliant at fostering links with parents. This natural link between school and parents begins with handing the children over every morning, but can be fostered by sharing sessions where parents find out about the work of the Foundation Stage unit. A class blog is the natural extension of this, because at this age parents are arguably most actively involved in their child's development. Besides the reader stats for a blog, 1 measure of involvement is the number of comments. As mentioned previously, our FS team set 'homework' for parents to look at the blogs with their children, encouraging comments where possible. Here are some examples of parental involvement (Comments by parents, comments by children), which demonstrate the strengthening of home-school links. If you use websites which you want children to access at home and at school (eg Bugclub, Mathletics, Purple Mash), the icons and links to the sites can be added to a blog, allowing important websites to be shared in the same place, whilst also serving as a visual reminder to both children and adults of how to support learning away from school. If children have regular access to iPads, displaying their digital work also becomes a possibility! If you see examples of other uses of Foundation Stage blogs, please share and I can amend this post! I think the next blog post will focus on developing blogs in Key Stage 1. This website was created by Mark Temple, teacher at Tanfield Lea Community Primary School.